The Wandle industries waxed and waned over the 19th century, but managed to survive. Little changed on the farms, and elderly residents in the early 20th century could look back on the Merton of their childhood as a still-rustic scene. However, Merton briefly gained notoriety in 1836 as a murder scene (see Bulletin 126 ). In 1894 Punch magazine recorded another shock, the election of village blacksmith G W Shotter (see Bulletin 193 ) to the newly-formed parish council! 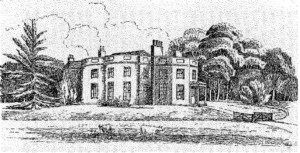 Engraving of Cannon Hill, published 1925. The wealthy were still attracted to Merton as a rural retreat. 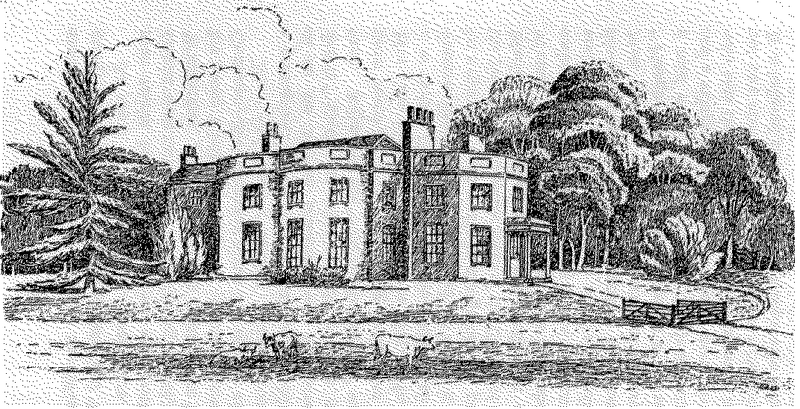 Multi-millionaire Richard Thornton (see Bulletin 184 ) had a grand residence at Cannon Hill from about 1845 until his death in 1865. He made his money in the Baltic trade and in marine insurance. In his will he left money to build a new school in Merton. Tenants of Abbey Gate House included actress Kate Vaughan (see Bulletin 157 ) and, later, journalist George Warrington Steevens (see Bulletin 122 ) and his wife Christina (see Bulletin 136 ). But Church House had been occupied by pauper children from Bermondsey between 1820 and 1845, and then became a boarding school run by the de Chastelain family (see Bulletin 172 ) from 1849 to1893. The railway would bring many changes. Wimbledon station opened in 1838 and Morden (now Morden Road tram stop) in 1857, Lower Merton (later Merton Park) and Merton Abbey in 1868, and Raynes Park in 1871, the last station to open for more than 50 years. Raynes Park preserves the name of Edward Rayne, who farmed much of the west of the parish. Around 1865 John Innes began developing the Merton Park estate on approximately 500 acres (200 ha) in Merton (mainly), Morden and Wimbledon. Other housing developments followed – in Grand Drive in the 1880s, Bushey Mead and the southern end of West Barnes Lane at the turn of the century, and the Polytechnic Estate west of Merton Hall Road at the beginning of the 20th century. Artist John William Godward (see Bulletin 151 ) moved into 3 Dorset Road with his parents in the 1870s, but moved across the Kingston Road to 7 Wilton Road (now 43 Wilton Grove) in 1882. Merton’s population grew from 800 in 1801 to 4,500 in 1901, and had more than doubled again by 1907 when it became an Urban District. See data at https://www2.merton.gov.uk/community-living/statistics/censushistory.htm. The old church school was expanded, and new schools were built to the east and the west.